A new entry has been made in the section of this site that has been designed to focus upon personal risk management issues in specific life domains. This entry continues our focus on linkages among potential pitfalls (also called "cascades of risk") in peoples' lives, or in the lives of their loved ones, and on the implications of these linkages for the design of their risk management responses. For example, how much are people aware of and attentive to these linkages? And if they are attentive, how much does the attention affect their personal integration of separate risk management responses? Questions such as those and their potential answers led to the development of the concept of comprehensive personal risk management (CPRM). The text that reflects initial thinking concerning CPRM is spread across Chapter 1 and the theoretical sections of Chapters 5 and 6 of Key Demographics in Retirement Risk Management. The new web site section cited above represents a broadened theoretical framework, where CPRM is just one component. In the new web site section you will find a synopsis of the first paper placed there, and a link to the full PDF document. That paper offers a broadened theoretical framework to guide study on systematic variations among population sub-groups in the extent to which their risk management behaviours approximate the ideal of CPRM. A second paper has been completed. Its title is “A Great New book on America’s Coming Retirement Crisis Helps Us Highlight the Need for Comprehensive Retirement Risk Management”. It's synopsis follows. In Falling Short: The Coming Retirement Crisis and What to Do About It (Oxford 2014), the authors (Charles D. Ellis, Alicia H. Munnel, with Andrew Eschtruth) have written a book that deserves to be read by all adults whose incomes rely upon debt-based economic systems around the world. The evolution of the United States retirement income system presents some features and challenges for pre-retirees that are likely to be found in many countries as we go forward into this new century. Ellis, Munnel and Eschtruth have done a brilliant job of dealing with the issues surrounding retirement income inadequacy in the USA. For many people, effective risk management to address income inadequacy inevitably brings us to a broader conception of the retirement challenges than that provided by the authors, however. This broader conception leads us to variables in life domains not discussed substantially by the authors. 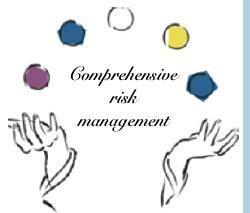 Issues across these life domains present us with a concert of linked risk management questions. By attending to these linkages, we can reach for contributions to solving the economic issues that the authors have very nicely elucidated. Moreover, our inevitably limited resources are best deployed when we take into account as much as feasible the full spectrum of risk management questions that are pertinent in our lives, which means that we approach the ideal of comprehensive retirement risk management (CPRM). Where are the resilient local communities where services can be exchanged? What if we brought proactive caring back into health care? Have we only three options? Is wise investment good enough? Click here to retrieve the full document (a PDF file). At the end of that file, you will have a link to the Amazon page where you can buy Falling Short: The Coming Retirement Crisis and What to Do About It (Oxford 2014). Click here to go to the Table of Contents for the new web site section. where you will find a synopsis of the first paper cited above. Parts of the central thesis of Key Demographics in Retirement Risk Management are to be found in text segments spread across Chapters 1, 4, 5 and 6. Researchers, educators and graduate students concerned retirement issues, as well as financial advisors and retirement planners concerned with retirement planning risks, will find in these chapters other details relevant to their work. Persons in these groups should click here for more information. 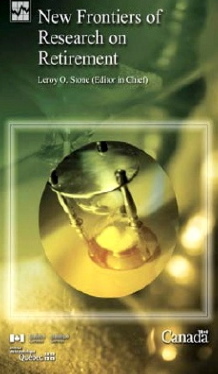 Note: You will find chapter titles at the bottom of the Springer main page for this book. At that page, click on "Read online" to go a page with the detailed table of contents, and an opportnity to see segments of the text, and to buy the eBook version. Also Amazon has published a Kindle edition. Our retirement blogs are designed to be educational, and to provide hard-to-find and useful information often supported by innovative 'mining' of microdata files. They will address issues linked to persons' later-life transitions, one of which is retirement from a job and eventual final departture from the labour market. Encountering later-life trasnitions and their attendant risks is inevitable for members of aging cohorts, and these blogs deal with aspects of these risks and related risk management strategies. I hope you will find something useful among these texts.Click here >->"Retirement blogs" to see all the earlier blogs. Sorry! The pages for this topic are under construction. Note: Clip art images are obtained from "Art Explosion" by Nova Development Corporation (1998 edition), and distributed in accordance with the License Agreement published in the User Manual. (c) 2012 Leroy O. Stone. All rights reserved.